The province of Lampung is on the south most tip of Sumatra. It is known for its history of geographical instability, the site of very big and destructive natural disasters such as the 6.4 strong earthquakes in 2005 and the devastating consequence after the Krakatau’s angry fury in 1883. 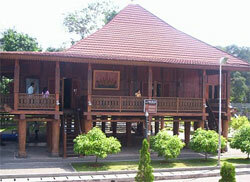 Lampung had a rich weaving tradition. The most luxurious of all Lampung textiles (the palepai) had gold woven into it and was only allowed to be worn by the noble families in Kalianda Bay. Other textiles allowed by all levels in Lampungese society were called tatibin and tampan. Themes usually woven into the textiles are of Buddhist and naval motifs. Unfortunately, province wide production was halted after the collapse of the pepper trade and so today, these textiles are very highly prized by collectors. Lampung has a few places of interest. The Way Kambas Reserve is a place to catch a glimpse of wild Sumatran tigers and elephants as well as many species of birds. The WWF has a partially funded project in this sanctuary, the Way Kambas Elephant Training project. A popular activity here is to rent a motorboat and speed down Way Wako River. More sailing can be done along Way Kanan and Way Kambas. Another interesting trip is out to the uninhabited Krakatau island, the ominous volcano which has remained quiet for centuries now. Anak Krakatau (Child of Krakatoa) is fascinating as it slowly rises from the sea as years pass. Lampung’s provincial capital Bandar Lampung enjoys a great location in the hills overlooking Lampung Bay, and gives a distant view of Mt. Krakatoa. Bandar Lampung consists of the administrative centre Tanjung Karang, and the port and trade area Teluk Betung. Attractions in the area are the Krakatoa monument in Jalan veteran, the Way Kambas National Park which trains elephants, the Bukit Barisan Selatan National Park at the western coast, and the megalithic ruins to the eastern plains of the city. Metro is a large city in Lampung which features a well-organized urban planning built in 1936. There are designated streets for residences, offices, and parks. The city though is largely agricultural and relies on farming and trade. Early transmigration helped Metro city to flourish, and it was once the capital of Central Lampung. The city is now subdivided into 5 districts. Nice places to check out here are the Merdeka Garden with an amusement park and playground, and the sports centre Stadion Tejosari & Kolam Renang.